Washington State Attorney General Bob Ferguson, a Democrat whose federal lawsuit halted enforcement of Trump’s first travel order, said he has concerns about the new version but is unsure if he’ll challenge it. The immigration order signed Monday by President Donald Trump cured some legal flaws in his previous travel ban but could still prove vulnerable to court challenges, according to legal experts. The narrower travel ban bars new visas for citizens from six Muslim-majority countries and temporarily shuts down the nation’s refugee program, with the White House saying those moves are justified by national security. 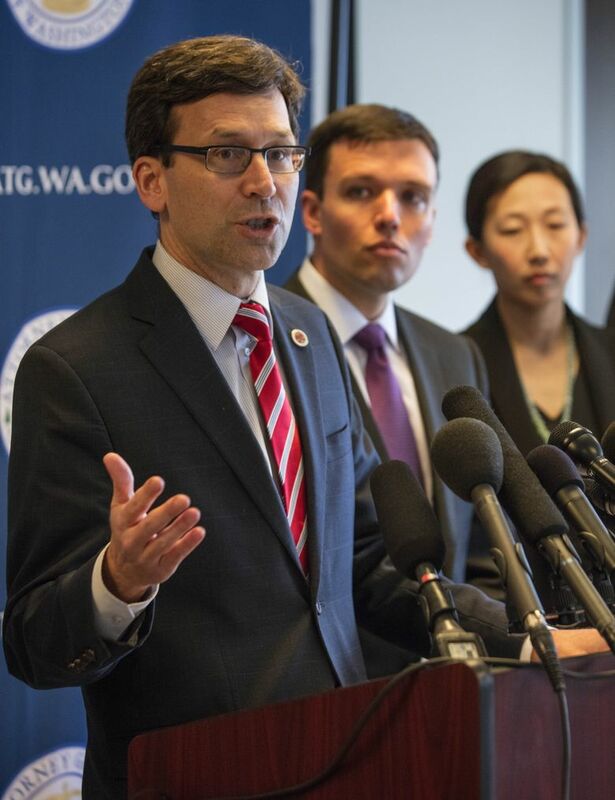 Washington State Attorney General Bob Ferguson, a Democrat whose federal lawsuit halted enforcement of Trump’s first travel-ban order, said he has concerns about the new version but doesn’t know yet whether he’ll challenge it. “I do not take lightly suing the president of the United States,” he said at a news conference Monday in Seattle. Some constitutional- and immigrant-law experts said changes in the latest travel-ban order make it more likely to withstand legal scrutiny. Who qualifies as a refugee? How many refugees come here? How are they screened? What is a green card? How do people get green cards? And what about immigrants who enter the country illegally? We help define and explain things you might not know about immigration. Monday’s order removed Iraq from the list of affected countries and will not apply to existing visas or green-card holders. It also avoids any mention of favoring particular religious groups. That makes it less sweeping than the previous order, which led to the cancellation of 60,000 visas and widespread chaos and protests at airports. Still, Kidane said the new order also could face legal hurdles for its impact on immigrants seeking entry to the U.S., frequently with the aid of family members and employers. He pointed to the Immigration and Nationality Act of 1965, which bans discrimination against immigrants based on national origin. Others say basic constitutional pitfalls remain over the particulars of Trump’s order — and the motivation behind it. “They’ve tried to clean it up and there are some changes that will probably count as improvements when it goes through judicial review, but I think there are still serious constitutional questions,” said Andrew Siegel, a professor of law and constitutional expert at Seattle University. While the new travel ban does not mention any religion, Siegel said discrimination objections to the previous version were never about what was in the text of the order itself. During his presidential campaign, Trump called for “a total and complete shutdown of Muslims entering the United States” until the country could be assured of safety. Earlier this year, Trump said he wanted to prioritize Christian refugees. And a leaked Department of Homeland Security report cast doubt on the security justifications for the travel ban, calling citizenship of a particular nation an “unreliable” threat indicator. “That evidence doesn’t go away just because they issued a new ban,” Siegel said. 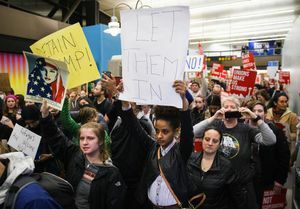 Trump and administration officials have argued his travel ban was not motivated by anti-Muslim animus but by a need to pause and review security and vetting procedures before admitting people from nations identified as hotbeds of terrorism. Regardless of whether Washington state challenges Trump’s new order, Ferguson and some other Democrats took Monday’s news as a chance for another victory jig. With the new order explicitly rescinding the previous one, Ferguson called the “capitulation” proof the state’s case had been correct. He needled Trump for the president’s “SEE YOU IN COURT” tweet after the 9th Circuit Court of Appeals declined to reinstate the travel ban. At his own news conference Monday, Gov. Jay Inslee called Trump’s new order “a full-blown retreat … the first one he’s been forced to make.” Despite its alterations, Inslee argued the new order “maintains the president’s mean-spirited approach” and was in keeping with the previously stated intent to ban Muslims. Local immigration-rights advocates were not impressed with the revised ban. “They’re putting lipstick on a pig,” said Jorge Barón, executive director of the Northwest Immigrant Rights Project (NWIRP). He said the ban still would affect family-visa petitions — applications filed by U.S. citizens and permanent residents on behalf of family members they want to bring to the U.S.
NWIRP filed a proposed class-action lawsuit after the initial travel ban, contending it infringed upon due process and equal-protection rights of those living here. While the president has been granted much authority over border security by Congress, his executive power has limits.